Photos are beginning to come through from the picket in London to protest that King Mswati III of Swaziland has been invited to take part in the Jubilee celebrations of the UK’s Queen Elizabeth. The King, sub-Saharan Africa’s last absolute monarch, is staying at the Savoy Hotel, where rooms cost about £400 per night. He is reported to have taken an entourage of 30 people with him from Swaziland. 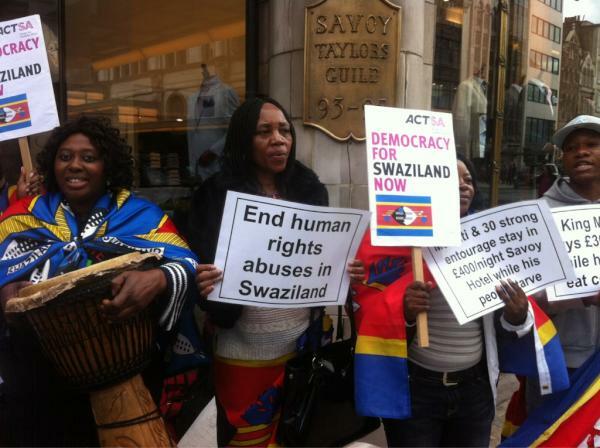 The Swazi Vigil organised a protested outside the hotel today (16 May 2012). The Swaziland Vigil is also planning to picket the Swaziland High Commission on Saturday 19 May when King Mswati is due to hold a dinner.